This route around the harbour gives most everyone in town a good view of the boats as they race. 2018 marks the 7th annual Harbour Cup Race. It began in 2012 as part of the Mussel Bed Soiree, sponsored by the Town of Lewisporte and administered by the Lewisporte Yacht Club. In 2016 it was renamed the Captain Peter Watkins Harbour Cup Race in honour of Peter Watkins. 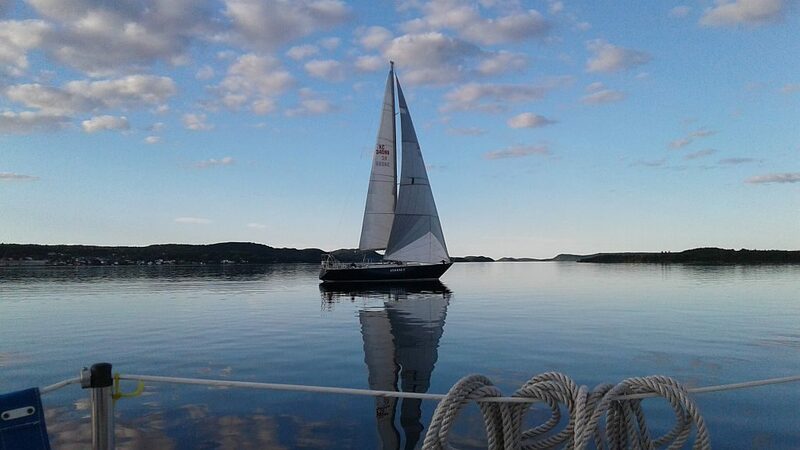 Since moving back to Newfoundland from Ontario in 1996, Captain Watkins has been instrumental in the growth of sailing in this part of the province. As a sailing instructor, his passion helped introduce many people to the activity, and in his time, the number of sailboats at the LYC went from just a couple, to now rivaling the number of power boats. With that amount of sailboats in the marina, it was only natural that racing would follow. The Harbour Cup, as the name implies, takes place within Lewisporte Harbour, with the starting line just outside the marina entrance. It is one of the first events kicking off the Soiree, happening on Wednesday evening. In past years, the start time was 19:00, but winds tended to die out leaving some boats unable to complete even one lap around the buoys within the 2 hour time limit. This year, we are going to start at 18:00 in hopes of catching the wind. The skippers meeting will be held in the LYC clubhouse at 17:30. That is where last minute entry forms can be filled out, and announcements of exact start time, route and direction will be made. The day of the race may be changed too, if conditions are unsuitable on the Wednesday, as happened in 2017 when it was held on the Friday. There are 3 buoys in the harbour which are used for racing, 2 are yellow and one is the green lateral navigation buoy. Depending on the winds, the race direction will be either clockwise or counter-clockwise, and can be any combination of buoys, but is generally one to three loops of all of them. 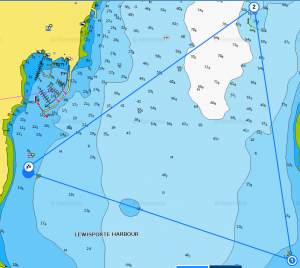 The start/finish line is between the two orange LMAA mooring balls, with a yellow buoy near the southernmost one. This is the buoy rounded for multiple laps. The Captain Peter Watkins Harbour Cup Race is meant to be a fun experience, open to sailors of all skill levels and crew compliments. Because of that, no spinnakers are allowed. This will probably change, however, when there are enough boats to make having different categories possible. There are no special memberships needed, only requiring that your boat be safe, seaworthy and insured, and at least one person aboard must have some sailboat training or experience. VHF channel 13 is used during the race, and must be monitored for instructions from the committee boat. The decision to change the number of laps, or even the route, may happen on the water after the race has started. The cup presentation takes place at a social in the clubhouse following the race. It may take a little time to calculate the results, but there will be food trays, and some teams cook up an after race meal. All participants are encouraged to attend. 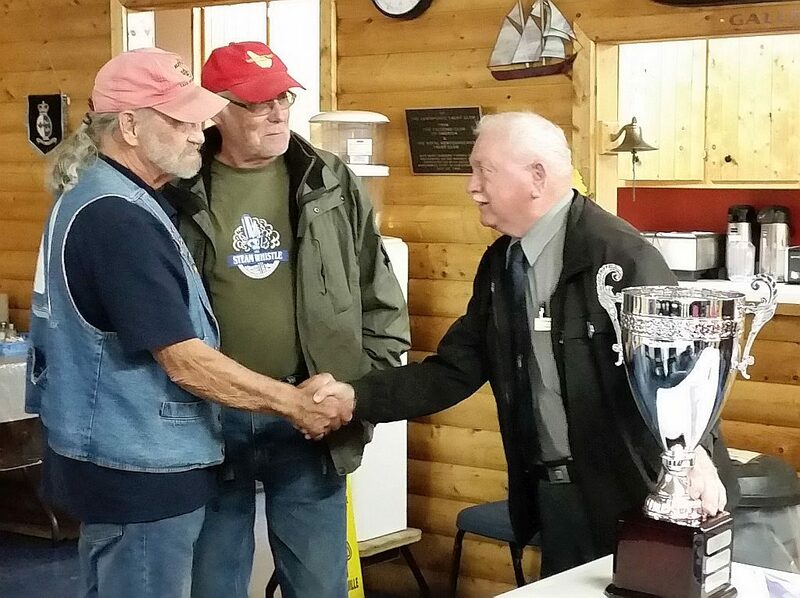 Town Councillor Ed Vatcher thanks Peter Watkins for his years of promoting boating in Lewisporte at the 2016 event. 2017 cup winner, Adanac II, leaves a small wake despite the almost non-existent winds which stalled some of the other participants, and forced the race to change days. 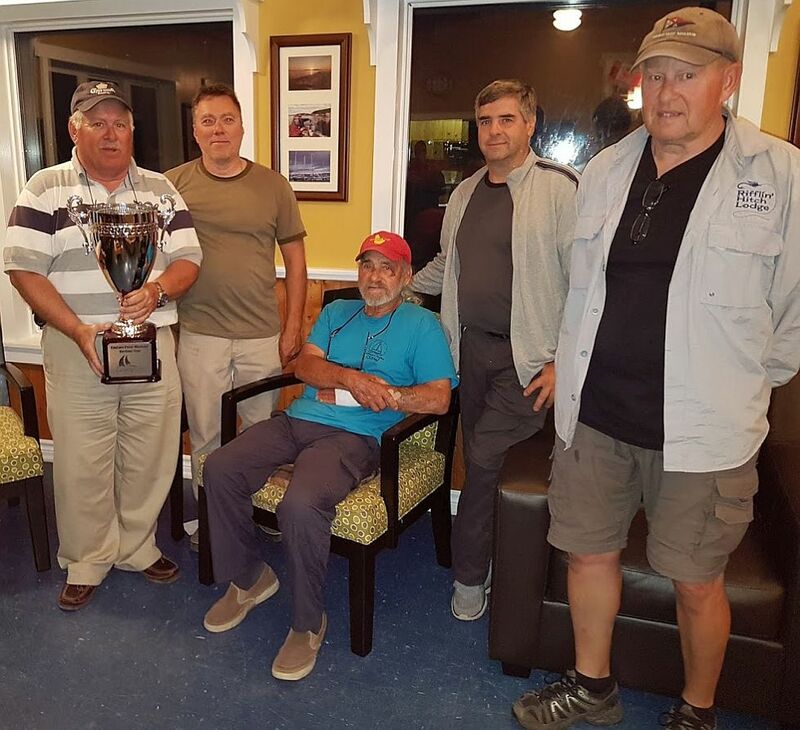 Richard Small (Adanac II, 2017 winner), Terry White (Showa), Captain Peter Watkins, Peter Haliburton (Serenity), and Aiden Cox (R.O.J.J. ).